Poverty in Latin America is widespread, but mostly has seen slow small improvement in recent years. Its poorest people are the peasants, whose extreme poverty seems mainly due to unfair distribution of wealth. 1. 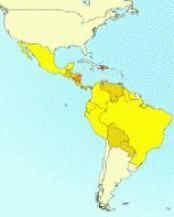 Latin America has generally attracted more foreign investment than Africa or Asia but often involved this making countries reliant on unstable short-term North American speculative foreign investment (Africa and Asia have mostly attracted less foreign investment but with more of it being stable longer-term European investment). Allied with expensive high interest rate aid loans, this has made escaping poverty very difficult for many Latin American governments. 2. 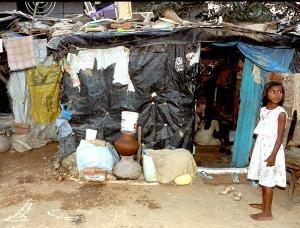 Poverty in some Latin American countries has been worsened by migrations, internal conflicts and bad government. 3. In some Latin American countries poverty is largely due to the pressure of population growth on scarce resources. 4. In some of the region drug-related social and political instability helps maintain poverty. Latin American poverty is worse in some countries like Ecuador, Paraguay and Peru - but has improved in recent years in some countries like Mexico helped partly by improvement in education. But notably Latin America has recently been increasing military spending, as poverty has started increasing again. And Latin America is an area where aid debt also seems a major obstacle to progress.